He was born on 25 April 1922 in Khandbaz Tehsil Nakial (Azad Jammu & Kashmir). He was enlisted in the Royal Corps of Engineers in British Indian Army on 18 March 1941. 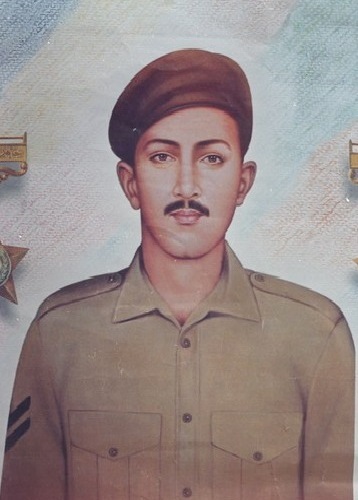 After completing his service in the British Indian Army in 1947, he came back to his native town and started establishing Haidri Force with the support of Sardar Fateh Muhammad Karailvi. On 1st Janaury 1948, Haidri Force was raised as “Sher-e-Riasti Battalion” under the command of Lt. Col. Muhammad Sher Khan. Due to his unflinching devotion and undaunted courage, on the recognition of his dedication and commitment to the cause, he was accoladed with the rank of Naik and was made platoon commander. He set personal examples of gallantry and inflicted heavy losses on the enemy at Bhudha Khanna where his platoon was given the responsibility to defend Budha Khanna where he faced never-ending frontal and crossfire from machine guns. He defended the post with chivalry, which he established with his few jawans and repulsed many aggressive ventures by the enemy and imposed colossal losses on them. The enemy used every mean to capture the post with two companies attack and heavy Arty bombardment but with unwavering determination and passion for Martyrdom bought the enemies on their knees. Despite facing all odds, he led his jawans while setting personal example of bravery and valour and remained steadfast and unmoved on the post. During the course of action, despite being hit on his chest by Arty fire, he retained his position and frustrated the Indian assault. Due to severe injuries he embraced Martyrdom on 26 October 1948. On 14th March 1949, the Defence Council of Azad Jammu & Kashmir adorned him with Hilal-e-Kashmir (posthumous) and on 30th November 1995 Government of Pakistan initiated the gazette notification to declare his Hilal-e-Kashmir equilent to Nishan-e Haider.